As much as I enjoy watching Masterchef, I hate it when the contestants start to get all teary eyes and trembling lips when they serve up a dish that could possibility see them to the elimination door. And when the producers of the show think that there are not enough tears or drama for the week, they will get the judges to ask silly questions like “Why are you here”. That will definitely get one or two tears rolling complete with a sad life story of sort. This never fails to give me a knee-jerk reflex to channel surf. If I want drama, back stabbing, bitching, complete emotional melt down and racism, I could have watch My Kitchen Rules (which is a stupid program that I accidently watch when I have one of my knee-jerk reflex moments). Fortunately, 80% of the time, Masterchef is about creating mouth-watering beautiful food. I admire that the contestants seem to have the ability to remember 1001 recipes (which must be one of the secret entry requirements) and working under impossible stressful conditions. By the way, my new favourite celebrity chef is Marco Pierre White. Jamie Oliver will now, unfortunately, take second place. In case you are wondering, there is a reason for my rant about Masterchef. 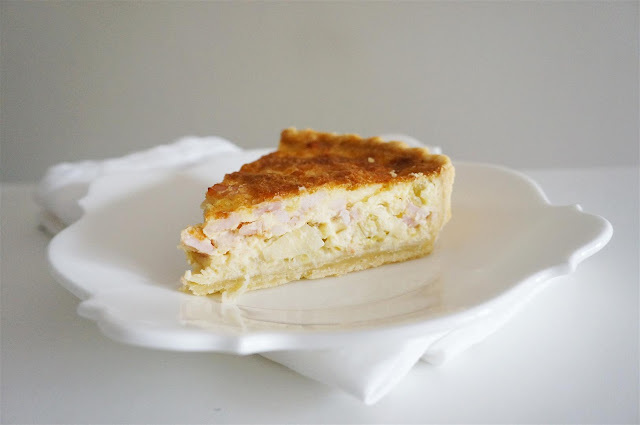 Because this classic quiche lorraine is a Masterchef 2012 recipe by Gary Mehigan. I was hesitant to try this recipe at first because the Masterchef website is notorious for posting incomplete recipes or recipes that simply doesn’t work. Place butter, flour and salt in a food processor and process until the mixture resembles fine crumbs. Add the egg and lemon juice and process until the dough just comes together. Knead gently and briefly on a lightly floured surface until the dough is smooth. Do not overwork. Form into a ball, flatten into a disc, cover with plastic wrap and refrigerate for 30 minutes. Roll out the pastry between two sheets of baking paper until large enough to line 20cm round loose-based tart tin. Lift pastry into tin, ease into base and side. Trim off any excess pastry. Refrigerate 30 minutes. Preheat the oven to 200 degree celcius (or 180 degree celcius fan-forced). Place tart tin on baking tray. Line the pastry with a sheet of baking paper and pour in dried beans or rice. Bake for 20 minutes or until light golden. Remove paper and beans/rice. Lightly brush the pastry shell with egg white to seal. Return to the oven for another 5 minutes to crisp. Add 1 tablespoon oil in a large frying pan over a medium high heat. Add onion and leeks. Cook for 3-4 minutes or until onions are translucent. Add garlic and cook for 1 minute. Transfer onion mixture to a bowl and return pan to heat. Add remaining oil in the pan, add bacon and cook until golden, stirring occasionally. Add to the onion mixture and stir to combine. Spread over a double thick sheet of paper towel to drain. Whisk cream, eggs and yolks in a bowl until well combined. Season with salt and pepper. Fill the base of the cooked pastry shell with onion and bacon mixture. Scatter over half the cheese. Pour over egg mixture and sprinkle with remaining cheese. Bake for 20 minutes, or until set. Allow to cool before cutting.